Kasubi Tombs is the burial ground for Buganda Kingdom kings. Situated on Kasubi hill within Kampala, the Kasubi Tombs is an active tradition place in the kingdom. It is where the last four kings of Buganda are buried making it a very important religious centre for the royal family. It is also a place where the Kabaka and his representatives frequently carry out important rituals related to Ganda culture. A tour to the Kasubi Tombs is always part of Kampala City tour that also includes others places like the Uganda Museum, Bahai Temple, Namungongo Matyrs’ Shrine and many more. It is a place where you will get to know comprehensively all about the lives and history of the late Kings of Buganda Kingdom. The Kasubi tombs hill is divided into three main areas: the main tomb area located at the western end of the site, an area containing buildings and graveyards located behind the tombs, and a large area on the eastern side of the site used primarily for agricultural purposes. The entrance to the site is a beautifully built gatehouse called Bujjabukula. According to Ganda tradition, the guards who control access to the site hide behind a see-through woven reed screen, to keep watch round the clock in order to control access. This gatehouse was constructed using wooden columns supporting a thatched roof, with walls made of woven reeds. 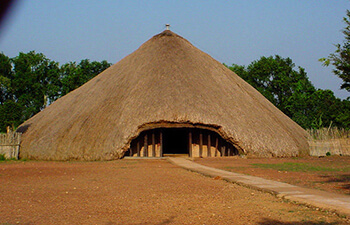 The Bujjabukula leads to a small courtyard which contains a circular house in which the royal drums are kept, the Ndoga-Obukaba. From this forecourt, one enters the main courtyard, enclosed by a reed fence and several houses built for the widows of the Kabakas and for other ritual purposes. The entrance into this courtyard is a striking experience as one immediately faces the main tomb building known as Muzibu-Azaala-Mpanga, which is the architectural work of art of this ensemble.